You can easily setup email on kindle fire hdx / kindle fire hd / kindle fire paperwhite 8.9. If you are facing problems while accessing your emails on kindle fire than check this guide. You can get your emails on kindle very easily. The E-mail application is compatible with most POP, IMAP and Exchange accounts, including Verizon, Gmail, Outlook and Yahoo !, and automatically adopt server options during setup. If necessary, configure your e-mail account manually, you need to setup your e-mail provider. Tip: Most e-mail accounts using different protocols for sending and receiving messages. If you are unsure of the protocol used by your e-mail account, contact your supplier. If your e-mail provider allows you to synchronize calendar and contact information, E-mail application will automatically synchronize with the Calendar and Contacts to your kindle Fire. Stand on the Home screen of your device, click Applications, and then click E-mail. Note: If you do not recognize your e-mail account, you must manually add it to your Fire. You need the following information in your e-mail provider to manually configure your account on kindle fire. Account Type POP3, IMAP or Exchange. 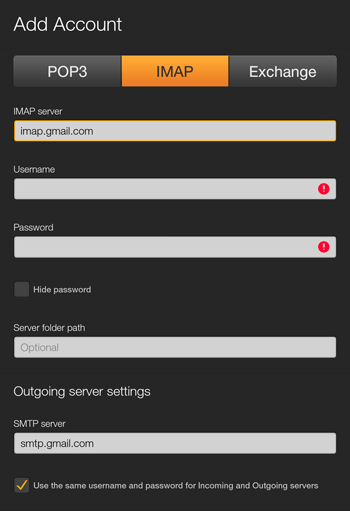 POP3, IMAP Server or Exchange Server Server Name entry. For example,imap.gmail.com or pop3.live.com. User name The e-mail or the user name of the account you’re setting. Password The password for the account you’re setting. Delete e-mail server (POP3) Tap Never if you do not want to be deleted emails from the server when you delete them from your inbox or Deleting messages if you want the e-mails are deleted from the server when you delete your Inbox. Domain (Exchange) Domain name server Microsoft Exchange. SMTP server (POP3, IMAP) Outgoing server name. Smtp.gmail.com orsmtp.live.com eg. Security settings and ports Check the security settings are correct input and output. Contact your e-mail provider for the correct options. Note: Exchange normally requires that you accept the policies of the device determined by the system administrator. If necessary, you will be asked to accept policies such as PIN or password and encryption device. Follow the instructions to complete the account setup.